A fresh coat of paint can instantly enhance the appearance of your home and is one of the most cost-effective things you can do. Start by focusing on high-traffic areas like main hallways, kitchens and bathrooms. In terms of color, go for something more neutral to ensure your home appeals to largest number of potential buyers. Light grey or light beige tones are popular among brokers and stagers when they work with sellers to neutralize and update the look of homes. “Greige,” a tone that can give the appearance of either light grey or beige, is a great choice. You don’t have to completely gut your kitchen to give it a move-in ready look. For a minor remodel, consider refacing or repainting outdated cabinets and drawers or installing new hardware with a modern design. 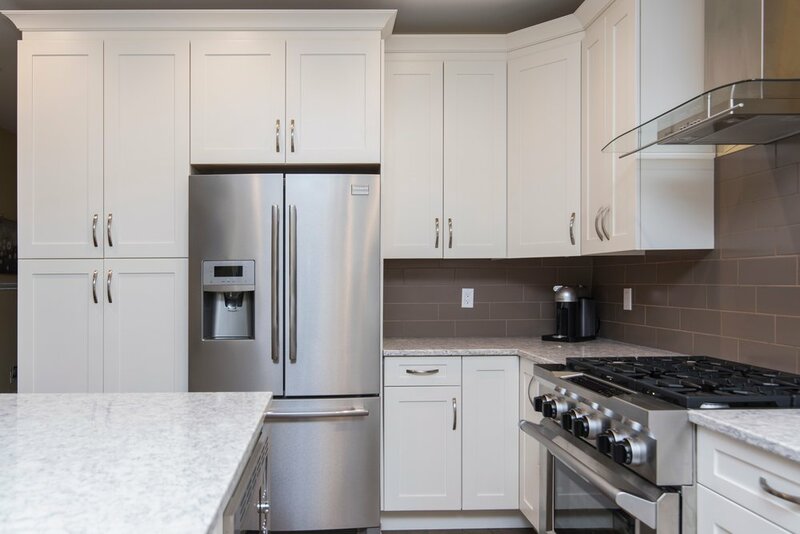 Cabinets are one of the first things people notice when they walk into a kitchen, and this is a simple way to change their appearance without replacing them entirely. While everyone has different preferences, converting cabinets to white tends to yield the most positive reaction. You can also give your kitchen a facelift by upgrading the light fixtures and appliances, replacing the countertops, or adding a new backsplash. Before and after photos show the dramatic transformation of a kitchen in a North Shore home (61 Coventry Road). While plumbing and electrical upgrades can be costly, smaller bathroom upgrades can still make an impact. If a quick makeover is in order, consider new paint or shelving. Other common upgrades include replacing the vanity, tile, light fixtures and countertops. Hardwood floors top many buyers’ wish lists due to their appearance and durability. If you already have hardwood floors, refinishing them can quickly elevate the look and feel of your home. Homeowners who want to replace their carpeting have a variety of options, from real hardwood to less expensive alternatives like laminate or engineered wood flooring. Curb appeal can have a significant impact on how many buyers will be enticed to take a closer look at your home. Attractive landscaping enhances curb appeal and makes a lasting first impression on potential buyers. After all, it’s the first thing buyers will see in person and probably in photos, too. According to Remodeling’s 2018 Cost vs. Value Report, other updates to the exterior of the home such as replacing garage doors and front entry doors can offer the greatest return on investment. It is important to start the conversation with your broker before you are ready to list your home so you can get their advice and ensure that you are making the best first impression when entering the market. Written by Helena Kim. This post originally appeared on @home, an @properties blog.